with a pulse rate of 12 to 15 pps can be used, which exposes the patient to less radiation. During the entire bolus passage through the esophagus, the patient should not swallow, as this would immediately interrupt peristalsis. Topography and radiographic anatomy will not be dealt with in this abstract. Functional muscular anatomy divides the pharyngeal musculature into three groups: the elevators, the constrictors and the pharyngoesophageal sphincter. 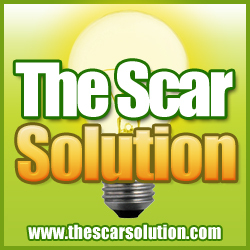 The elevators insert at the base of the skull, the jaw, the hyoid bone and the thyroid cartilage. These muscles move the laryngopharynx upward and forwards at the beginning of the pharyngeal phase. The constrictors, consisting of the ceratopharyngeus, the thyreopharyngeus and the oblique part of the cricopharyngeus muscle, propel the bolus through the pharyngeal cavity by their peristaltic activity in conjunction with the tongue rolling backward and downwards over the hyoid bone. The pharyngoesophageal sphincter, consisting of the transverse portion of the cricopharyngeus muscle and adjacent transverse fibers of the esophageal musculature, maintains a tonic contraction between swallows. As soon as peristaltic contraction of the constrictors begins, the sphincter relaxes completely and will not contract again until complete passage of the ingested bolus into the esophagus. Deglutition can be divided into an oral, a pharyngeal and an esophageal phase. The oral phase (phase 1) is under full voluntary control. First, the taste, texture and temperature of the bolus are analyzed. The voluntary act of swallowing is prepared by premotor activity of cortical areas in the cingulate gyrus, the insula and the inferior frontal gyrus. When a bolus has been recognized as edible and palatable, the motor activities in the oral phase are controlled by the precentral gyrus. After mastication, the bolus is loaded onto the back of the tongue. It is held there in the form of a spoon, between the back of the tongue and the soft palate and pharyngopalatine arch. The pharyngeal phase (phase 2), starts with a voluntary upward movement of the soft palate, allowing the bolus to flow into the mesopharynx, where it comes into contact with tactile receptors of the mucosa. This triggers the swallowing reflex via afferent fibres mainly from the cranial nerves IX and X, which run within the solitary tract. From here on, swallowing cannot be influenced by voluntary control. It is 'organized' and controlled by the medullary swallowing center, which consists of the nu cleus tractus solitarii, the nucleus ambiguus and surrounding parts of the formatio reticularis. Efferent pathways run within the cranial nerves V and VI, and, mainly, through the cranial nerves X and XII and their nuclei. Nerves X and XII anastomose to form the plexus pha-ryngeus. During passage of the bolus through the hy-popharynx, the airways have to be sealed to avoid aspiration. The entrance of the larynx is closed by axial compression of its vestibule during elevation of the larynx against the base of the tongue, while the glottis itself is closed by the action of the external and internal laryngeal musculature innervated by cranial nerve X. The esophageal phase (phase 3) is also initiated by the medullary swallowing center. Peristaltic contraction of the striated musculature within the first centimeters of the esophagus is innervated by 'early motoneurons' within the nucleus ambiguus, while the activity of the more distal smooth musculature is influenced by 'late motoneurons' within the nucleus of the vagus nerve. Here, peristaltic activity can also be induced by local distension, independent of the medullary center. During phase 1, the tongue collects a liquid bolus from the floor of the mouth with a symmetrical movement. The bolus is then contained within the oral cavity by the closed portal formed by the soft palate and the pharyn-gopalatine arch. Phase 2 is immediately initiated after opening of the portal. The soft palate is pulled up and backwards, until it comes into contact with the posterior pharyngeal wall and completely seals the passage between epipharynx and mesopharynx. The tongue rolls back and downwards over the elevated hyoid bone, initiating propulsion of the bolus, which is assisted and completed by peristaltic contraction of the pharyngeal constrictor. This is best seen in the lateral projection as a 'stripping wave', which moves downwards along the posterior pharyngeal wall. During passage of the entire bolus, the posterior aspect of the pharyngoesophageal junction is smooth. However, a slight bulge of the posterior wall amounting to less than one third of the sagittal diameter of the lumen, caused by some residual contraction of the pharyngoesophageal sphincter, is, especially in older patients, still considered as normal. At the beginning of phase 2, the larynx is elevated and compressed under the base of the tongue. The laryngeal vestibule, seen as an air-filled cavity before the beginning of phase 2, collapses completely. The epiglottis is tilted backwards and downwards over the aditus laryngis. A small amount of contrast agent may initially penetrate under the epiglottis into the laryngeal vestibule. It will, however, be completely ejected during further passage of the bolus. The glottis is closed during phase 2. In the resting state after a barium swallow, the pharynx shows only a thin contrast coating of its walls. No resid ual material should be pooled in the valleculae or the pyriform recesses. The aspect of the barium-coated pharynx should be symmetrical in the a.-p. projection; both pyriform recesses are at the same height and have a pointed lower aspect with an acute angle between the lateral hypopharyngeal wall and the 'floor' of the hypopharynx. Apraxia is characterized by difficulty or inability to initialize the pharyngeal phase of swallowing. A bolus that has been loaded on the back of the tongue is held there, then released to the floor of the mouth, then gathered and loaded again by the tongue etc., until the patient finally 'decides' to swallow. Phase 2 and 3 are usually normal. Apraxia occurs with cortical (mainly precentral) lesions, with psychogenic disorders (namely, anxious depression) or after long-time gastric tube or parenteral feeding. Impairments of phase 1 are usually due to impaired motility of the tongue. Lesions of the cranial nerve XII or its nucleus will lead to lax paralysis of the tongue, while lesions of the corticobulbar tracts lead to symmetric, spastic paralysis. Both types of lesions make gathering and loading of the bolus onto the back of the tongue difficult or impossible. Often, the bolus will have to be passively 'decanted' into the pharynx by tilting the head backwards. Parkinson's disease causes rigor or 'stiffness' of the tongue. The bolus is gathered from the floor of the mouth and swallowed in very small fractions ('piecemeal deglutition'). In patients with myasthenia gravis, tongue motility decreases with repeated swallows. Due to reduced tonus of the muscles inserting into the hyoid bone, the tongue sinks down into the floor of the mouth. Impairment of pharyngeal motility can be unilateral or symmetric, lax or spastic. Unilateral impairment is usually due to bulbar or cranial nerve lesions (X and XII), leading to lax paralysis. The bolus will pass mainly through the intact side of the pharynx, while the affected side passively bulges out. In the resting state after a swallow, the pyriform recess of the affected side contains a pool of residual material. Its floor is at a lower level than its counterpart and forms a more obtuse angle with the lateral pharyngeal wall. Bilateral, symmetric impairment can be caused by pseudobulbar palsy, by fibrous encasement ('frozen neck' after radiotherapy) or by myopathies. The muscle tone in the resting state is normal or increased. Bilateral laxity, with sagging and residual contrast pooling of both pyriform recesses develops after repeated swallows in patients with myas-thenia gravis ('fatigue phenomenon'). Nasal regurgitation occurs mainly with myasthenia gravis. It is usually possible to compensate for unilateral palsy of the velum palatinum after lesions of cranial nerve XII. Aspiration can occur in two forms, which are entirely different with respect to their mechanism and their severity. Primary as piration is due to a defective closure of the larynx during swallowing. The first protective mechanism is closure of the aditus laryngis by axial compression of the vestibu-lum under the base of the tongue. This mechanism can be impaired by palsy of the elevator muscles inserted into the hyoid bone (nerves VII und IX), of the tongue itself (nerve X), and by postoperative defects at the base of the tongue and the supraglottic part of the larynx. If glottic closure is still intact, only a small part of the bolus penetrates into the laryngeal vestibule during deglutition and is held there until reopening of the glottis after deglutition, when it is aspirated into the trachea. The second and last barrier against aspiration is closure of the glottis by apposition of the true and false cords of the two sides. If this mechanism fails, too, a part of the ingested bolus is aspirated directly into the airways. This very serious and life-threatening event can be produced by lesions of cranial nerve X at or above the ganglion nodosum (above the origin of the superior laryngeal nerve), by defects at the glottis itself, or by severe sensory impairment preventing the initiation of the swallowing reflex after penetration of the bolus from the oral cavity into the pharynx. In secondary aspiration, the laryngeal closure mechanisms are intact. Aspiration occurs because of a spillover of material retained in the pyriform recesses. The material penetrates into the larynx, which reopens after the pharyngeal phase of swallowing. This form of aspiration can occur with any disease that causes severe impairment in pharyngeal motility. The amount of aspirated material is limited to the amount of material retained in the pharynx. The risk of aspiration can be reduced by repeatedly swallowing after ingestion of a bolus. A systematic overview of the neuromuscular disorders that may cause impairment in swallowing is given in Table 1 and Fig. 1. Frequently, a specific diagnosis has already been established before the patient is referred for cineradiographic examination of swallowing difficulties. However, dysphagia or aspiration may be the first or most prominent symptom of a neurologic or muscular disorder. Here, the radiologist should not only describe the pathologic phenomena he has observed, but also give a differential diagnosis of the diseases that could be responsible. Dysfunctions of the pharyngoesophageal sphincter can be classified into alterations of its resting tonus and impairments of relaxation. Spasm (increased resting tonus) can only be diagnosed by manometry, and not by radio-logic methods, but only by. Chalasia (decreased or absent resting tonus) is a phenomenon that has only been observed in myotonic dystrophy or after myotomy of the sphincter. In conjunction with esophageal motility disorders, it can lead to reflux of esophageal and gastric contents into the pharynx and cause secondary aspiration. Incomplete relaxation (Achalasia), delayed opening and premature closure of the sphincter can occur without an evident underlying disease (idiopathic form) or sec ondary to a variety of diseases. An overview of the incidence and etiology of sphincter dysfunctions is given in Tables 2 and 3. The only effective therapy for sphincter dysfunctions, except those secondary to a curable underlying disease, is myotomy of the sphincter. Here, cineradiographic examination serves not only to diagnose the dysfunction, but also to establish indications for and contraindications against myotomy. A good result after surgery can only be expected if pharyngeal propulsion of the bolus is not severly impaired. In severe gastroesophageal reflux, myotomy is contraindicated as the pharyngoe-sophageal sphincter is the last barrier against reflux into the pharynx and aspiration of gastric contents. Zenker's diverticula invariably have their origin within Killian's triangle, between the pharyngoesophageal sphincter and the pharyngeal constrictor muscles. They are very frequently associated with dysfunctions of the sphincter, mostly with premature closure. Although the transition from a mere dysfunction of the sphincter into the formation of a diverticulum has not yet been demonstrated in a patient, a causative role of impaired sphincter relaxation is very probable. Lateral diverticula of the pharynx are very rare. Acquired diverticula can have their origin in a weak point of the thyreohyoid membrane or at the lateral wall of the pharyngoesophageal segment, between the cricopharyngeal muscle and the circular muscle fibers of the esophagus. Congenital di-verticula are communicating branchiogenic cysts. Their pharyngeal orifice is situated at the tonsillar fossa or the vallecula (2nd branchial cleft remnants) or at the lateral wall of the pyriform recessus (3rd and 4th branchial cleft remnants). This syllabus reviews the findings on esophagography for a variety of esophageal diseases, including reflux esophagitis, Barrett's esophagus, other types of esophagi-tis, benign and malignant esophageal tumors, varices, lower esophageal rings, esophageal intramural pseudodi-verticulosis, and esophageal motility disorders. Reflux esophagitis is by far the most common inflammatory disease involving the esophagus. The single most common sign of reflux esophagitis on double-contrast esophagrams is a finely nodular or granular appearance in the distal third of the esophagus, with poorly defined radiolucencies that fade peripherally due to edema and inflammation of the mucosa . In other patients, barium studies may reveal shallow ulcers and erosions in the distal esophagus contiguous with the gastroesophageal junction . Reflux esophagitis may also be manifested by thickened longitudinal folds due to edema and inflammation that extend into the submucosa. However, thickened folds should be recognized as a nonspecific finding of esophagitis. Other patients with reflux esophagitis may have a single enlarged, chronically inflamed fold that arises at the gastric cardia and extends into the distal esophagus as a smooth protuberance, also known as an inflammatory esophagogastric polyp . These lesions have no malignant potential, so endoscopy is not warranted when barium studies reveal typical findings of an inflammatory polyp in the distal esophagus. Scarring from reflux esophagitis can lead to the development of a reflux-induced stricture (i.e., 'peptic' stricture) in the distal esophagus, almost always above a hiatal hernia. Such strictures typically appear as smooth, tapered segments of concentric narrowing, but asymmetric scarring can lead to asymmetric narrowing with focal sacculation or ballooning of the esophageal wall between areas of fibrosis. Other peptic strictures may be manifested by short, ring-like areas of narrowing that could be mistaken for Schatzki rings in patients with dysphagia . Scarring from reflux esophagitis can also lead to longitudinal shortening of the esophagus and the development of fixed transverse folds, producing a 'stepladder' appearance due to pooling of barium between the folds . These folds should be differentiated from the thin transverse striations (i.e., 'feline' esophagus) often seen as a transient finding at fluoroscopy due to contraction of the longitudinally oriented muscularis mucosae . Barrett's esophagus is a premalignant condition in which there is progressive columnar metaplasia of the distal esophagus due to chronic reflux and reflux esophagitis. Barrett's esophagus is thought to develop in about 10% of all patients with reflux esophagitis. Double-contrast esophagrams can be used to classify patients with reflux symptoms at high, moderate, or low risk for Barrett's esophagus, based on specific radiologic criteria . Patients are classified at high risk when double-contrast esopha-grams reveal a mid-esophageal stricture or ulcer, or a reticular mucosal pattern (usually associated with a hiatal hernia and/or gastroesophageal reflux) . In such cases, endoscopy and biopsy should be performed for a definitive diagnosis. Patients are classified at moderate risk for Barrett's esophagus when double-contrast studies reveal reflux esophagitis or peptic strictures in the distal esophagus . The decision for endoscopy in this group should be based on the severity of symptoms, age, and overall health of the patients. Finally, patients are classified at low risk for Barrett's esophagus when double-contrast studies reveal no structural abnormalities. The majority of patients are found to be in this category, and the prevalence of Barrett's esophagus is so low that they can be treated empirically for their reflux symptoms, without need for endoscopy . Candida albicans is the most common cause of infectious esophagitis. 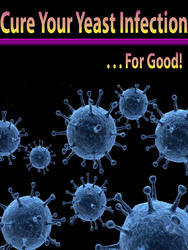 It usually occurs as an opportunistic in fection in immunocompromised patients, particularly AIDS patients. Only about 50% of patients with Candida esophagitis are found to have thrush, so the absence of oropharyngeal disease in no way excludes this diagnosis. Candida esophagitis is usually manifested on double-contrast studies by multiple discrete plaque-like lesions that tend to be oriented longitudinally and are separated by normal mucosa . Double-contrast esophagrams have a sensitivity of 90% in detecting Candida esophagitis , primarily because of their ability to demonstrate these mu-cosal plaques. During the past two decades, a much more fulminant form of candidiasis has been encountered in patients with AIDS, who may present with a grossly irregular or 'shaggy' esophagus caused by innumerable coales-cent pseudomembranes and plaques with trapping of barium between these lesions (Fig. 1) . Other patients with achalasia or scleroderma may develop a 'foamy' esophagus with innumerable tiny bubbles layering out in the barium column; this phenomenon presumably results from the yeast form of fungal infection . When typical findings of Candida esophagitis are encountered on double-contrast esophagrams, these patients can be treated with antifungal agents without the need for endoscopy. Fig. 2. Herpes esophagitis. Double-contrast esophagram shows multiple small, discrete ulcers with surrounding mounds of edema (arrows) in mid-esophagus clinical setting, small, discrete ulcers without plaques should be highly suggestive of herpes esophagitis, as ulceration in candidiasis almost always occurs on a background of diffuse plaque formation. As the disease progresses, however, herpes esophagitis may be manifested by a combination of ulcers and plaques, mimicking Candida esophagitis . Cytomegalovirus (CMV) is another cause of infectious esophagitis that occurs in patients with AIDS. CMV esophagitis may be manifested on double-contrast studies by multiple small ulcers or, even more commonly, by one or more giant, flat ulcers that are several centimeters or more in length . Herpetic ulcers rarely become this large, so the presence of one or more giant ulcers should suggest CMV esophagitis in patients with AIDS. However, the differential diagnosis also includes giant human immunodeficiency virus (HIV) ulcers in the esophagus (see next section). Because CMV is treated with toxic antiviral agents such as ganciclovir, endoscopy is required to confirm the presence of CMV before treating these patients. cers usually heal dramatically on treatment with oral steroids . Thus, endoscopy is required in HIV-positive patients with giant esophageal ulcers to differentiate esophagitis caused by HIV and CMV, so appropriate therapy can be instituted in these patients. Tetracycline and doxycycline are the two most common causes of drug-induced esophagitis in the United States, but other offending agents include potassium chloride, quinidine, aspirin or other nonsteroidal antiinflammatory drugs (NSAIDs), and alendronate sodium . Affected individuals typically ingest the medication with little or no water immediately before going to bed. The capsules or pills usually become lodged in the mid-esophagus where it is compressed by the adjacent aortic arch or left main bronchus. Prolonged contact of the esophageal mucosa with these medications presumably causes an irritant contact esophagitis. Affected individuals may present with severe odynophagia, but marked clinical improvement usually occurs after withdrawal of the offending agent. The radiographic findings depend on the offending medication. Tetracycline and doxycycline are associated with the development of small, shallow ulcers in the upper or mid-esophagus indistinguishable from those in herpes esophagitis . 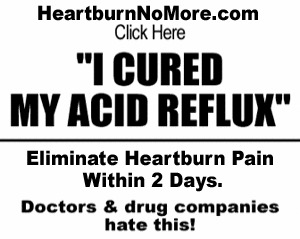 These ulcers almost always heal without scarring because of their superficial nature. In contrast, potassium chloride, quinidine, NSAIDs, and al-endronate sodium may cause more severe esophageal injury, sometimes leading to the development of larger ulcers and strictures . Idiopathic eosinophilic esophagitis (IEE) is a chronic form of esophagitis characterized by an increased number of intraepithelial eosinophils (more than 20 per high power field) on endoscopic biopsy specimens . The etiol ogy is uncertain, but this condition most likely develops as a result of an inflammatory response to ingested food allergens. Most adults with IEE are young men with longstanding dysphagia and recurrent food impactions . They classically have an atopic history (e.g., asthma, allergic rhinitis) and peripheral eosinophilia, but IEE frequently occurs as an isolated condition . Affected individuals are treated with topical steroids (swallowing me-tered doses of aerosolized steroid preparations) and protein-free diets with varying degrees of success. IEE may be manifested on esophagography by segmental strictures in the esophagus. The strictures often contain distinctive ring-like indentations, resulting in a so-called 'ringed' esophagus . Other patients with IEE may have diffuse esophageal narrowing, resulting in a 'small-caliber' esophagus . A ringed esophagus has also been described in congenital esophageal stenosis. Affected individuals may develop strictures with multiple concentric rings indistinguishable from those in IEE (Fig. 4) . Although congenital esophageal stenosis is usually not associated with an allergic history or peripheral eosinophil-ia, this condition also occurs in young men with longstanding dysphagia, and biopsies from the esophagus may also reveal increased numbers of intra-epithelial eosinophils . Due to the similarities in the clinical, radiographic, and pathologic findings of these conditions, the symptoms of some of the patients with reported congenital esophageal stenosis may have been due to IEE. Fig. 4. Congenital esophageal stenosis. Double-contrast esophagram shows mild narrowing of mid-esophagus with distinctive ring-like constrictions (arrows), most likely due to cartilaginous rings in wall of esophagus double-contrast esophagrams as small, sessile polyps with a smooth or slightly lobulated contour. In contrast, leiomyomas are the most common benign submucosal tumors in the esophagus, appearing on esophagography as intramural masses with the typical features of the submucosal lesions found elsewhere in the gastrointestinal tract. Fibrovascular polyps are rare, benign tumors consisting of fibrovascular and adipose tissue covered by squamous epithelium . Fibrovascular polyps usually arise near the cricopharyngeus, gradually elongating over a period of years as they are dragged inferiorly by esophageal peristalsis. Rarely, these patients may have a spectacular clinical presentation with regurgitation of a fleshy mass into the mouth or even asphyxia and sudden death if the regurgitated polyp occludes the larynx . Fibrovascular polyps typically appear on barium studies as smooth, expansile, sausage-shaped masses in the esophagus (Fig. 5) . Polyps composed predominantly of adipose tissue may appear as fat-density lesions on CT (Fig. 6a), whereas polyps containing adipose and fibrovascular tissue may have a more heterogeneous appearance with areas of fat juxtaposed with areas of soft-tissue density (Fig. 6b) . within a pre-existing peptic stricture . Superficial spreading carcinoma is another form of early esophageal cancer characterized by poorly defined nodules or plaques that merge with one another, producing a confluent area of disease . Advanced esophageal carcinomas usually appear on barium studies as infiltrating (Fig. 7), polypoid, ulcerative (Fig. 8), or varicoid lesions that mimic the appearance of varices due to submucosal spread of tumor . Squamous cell carcinomas and adenocarcinomas of the esophagus cannot be reliably differentiated on barium studies. Nevertheless, squamous cell carcinomas tend to involve the upper or mid-esophagus, whereas adenocarci-nomas are located predominantly in the distal esophagus. Unlike squamous carcinomas, adenocarcinomas also have a marked tendency to invade the gastric cardia or fundus, comprising as many as 50% of all malignant tumors involving the gastroesophageal junction . Esophageal lymphoma may be manifested on barium studies by submucosal masses, polypoid lesions, enlarged folds, or strictures. 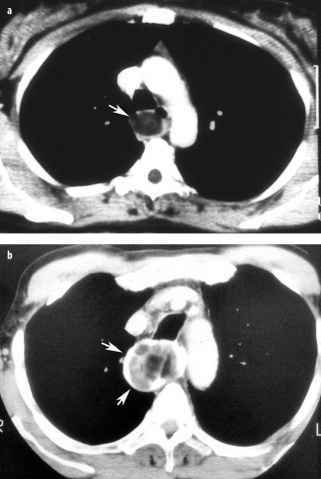 Spindle cell carcinoma (formerly known as carcinosarcoma) is another rare malignant tumor characterized by bulky, polypoid intraluminal masses that expand the lumen of the esophagus without causing obstruction. Other rare malignant tumors involving the esophagus include leiomyosarcoma and malignant melanoma. Uphill varices are usually caused by portal hypertension with hepatofugal flow through dilated esophageal collaterals to the superior vena cava. 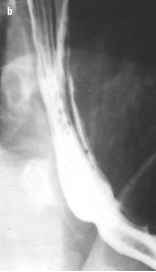 Uphill varices appear on barium studies as serpentine longitudinal filling de fects in the distal thoracic esophagus. They are best seen on mucosal relief views of the collapsed esophagus using a barium paste or high-density barium suspension. In contrast, downhill varices are caused by superior vena cava obstruction with downward flow via dilated esophageal collaterals to the portal venous system. Most patients with downhill varices present clinically with the superior vena cava syndrome. Downhill varices also appear as serpentine longitudinal filling defects, but these varices are almost always confined to the upper or mid-esophagus. The term Schatzki ring is reserved for symptomatic patients with lower esophageal rings who present with intermittent dysphagia for solids, especially meat. 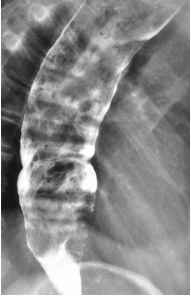 The rings appear on barium studies as smooth, symmetric ring-like constrictions at the gastroesophageal junction, almost always located above a hiatal hernia (Fig. 9a) . The rings can be missed if the distal esophagus is not adequately distended at fluoroscopy (Fig. 9b), so it is important to obtain prone views of the esophagus during continuous drinking of a low-density barium suspension . Conversely, rings can also be missed if the hiatal hernia is over-distended, resulting in overlap of the distal esophagus and hernia that obscures the ring . Rings with a maximal luminal diameter of more than 20 mm rarely cause dysphagia, whereas rings with a maximal diameter of less than 13 mm almost always cause dysphagia . Esophageal intramural pseudodiverticula consist of dilated excretory ducts of deep mucous glands in the esophagus. 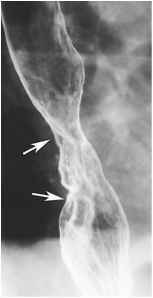 The pseudodiverticula typically appear on esopha-gography as flask-shaped outpouchings in rows parallel to the long axis of the esophagus (Fig. 10) . When viewed en face on double-contrast esophagrams, the pseudodiverticula can be mistaken for tiny ulcers. When viewed in profile, however, they often appear to be 'floating' outside the wall of the esophagus without apparent communication with the lumen . Barium studies often reveal an isolated cluster of pseudodiverticula in the distal esophagus in the region of a peptic stricture, so they presumably occur as a sequela of scarring from reflux esophagitis . Less frequently, the pseudodiver-ticula have a diffuse distribution and are associated with high strictures, or they occur as an isolated finding . When strictures are present, these patients may present with dysphagia, but the pseudodiverticula themselves rarely cause symptoms. on barium studies by tapered, beak-like narrowing of the distal esophagus adjacent to the gastroesophageal junction. In advanced disease, the esophagus can become massively dilated and tortuous distally (i.e., a 'sigmoid' esophagus). Secondary achalasia is also characterized by absent peristalsis in the esophagus and beak-like narrowing near the gastroesophageal junction. In secondary achalasia caused by a tumor at the gastroesophageal junction, however, the length of the narrowed segment is often greater than that in primary achalasia because of spread of tumor into the distal esophagus . The narrowed segment may also be asymmetric, nodular, or ulcerated because of tumor infiltrating this region. In some cases, barium studies may reveal other signs of malignancy at the cardia with distortion or obliteration of the normal cardiac rosette . The clinical history is also important, as patients with primary achalasia almost always have longstanding dysphagia, whereas patients with secondary achalasia are usually older individuals (over the age of 60) with recent onset of dysphagia (less than six months) and weight loss . Symptomatic diffuse esophageal spasm (DES) may be manifested on barium studies by intermittently weakened or absent primary peristalsis with repetitive, lumen-obliterating nonperistaltic contractions, producing a classic 'cork-screw' esophagus . More commonly, however, these patients have multiple nonperistaltic contractions of mild to moderate severity without a corkscrew appearance . The majority of patients with DES have also been found to have impaired opening of the lower esophageal sphincter on barium studies, with beak-like narrowing of the distal esophagus similar to that seen in achalasia . It should therefore be recognized that DES is characterized radiographically by frequent LES dysfunction with nonperistaltic contractions of varying severity, rather than a classic corkscrew appearance. Where is usually a hatial hernia located? What Is A Barium Esophagram?